Connor McDavid heard teammates talking about another potential lockout when he entered the NHL — in 2015. 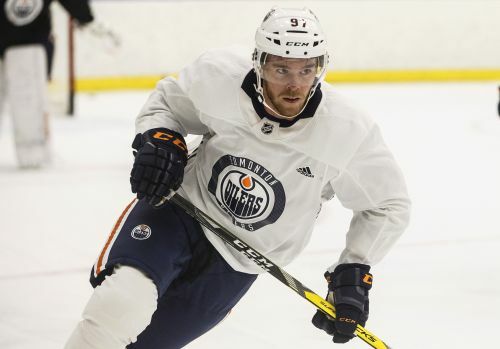 As he became one of hockey's best players and signed the richest annual contract in the league, McDavid says he remains optimistic there will not be another work stoppages like those in 2004-05 and 2012-13 — but he protected himself anyway with contract language guaranteeing some early payment, just in case. "Both parties have kind of prepared so long for it," McDavid said. "I genuinely believe that both sides want to keep playing. We want to play and the owners want to keep making money." The NHL has reached almost $5 billion in revenue, up from just $437 million in 1993, and is in the midst of a U.S. TV deal with NBC that pays $2 billion and a Canadian TV deal with Sportsnet that pays almost $5 billion. The growth and popularity of NHL hockey is undeniable, yet labor issues are bubbling beneath the veneer — again. The current collective bargaining agreement cannot be terminated until September 2020, but there is a key date looming 12 months from now: On Sept. 1, 2019, the league has the option and then, on Sept. 15, the Players' Association has the option to terminate the labor pact. Another battle is brewing, with revenue, escrow payments and the Olympics among the top issues expected to be on the table. "Everyone has a pretty good understanding of what the PA's trying to get done and what the NHL's trying to get done," New York Rangers forward Chris Kreider said. "I don't think the conversation about (hockey-related revenue) is going away any time soon. It's such a kind of ambiguous and often argued-about point. I know guys want to go to the Olympics, and I know guys don't like escrow." NHLPA executive director Don Fehr told The Associated Press he didn't necessarily expect one side or the other to reopen labor talks but "that's what you plan for, and you sort of assume it's going to happen because otherwise you're not ready." Commissioner Gary Bettman told The AP he's "a fan of stability and labor peace. We're not looking for a dispute." Bettman proposed a three-year extension of the current CBA through 2025 in exchange for the league agreeing to participate in the 2018 Olympics. As much as players wanted to go, they rejected that deal — a signal they have concerns with the deal signed in 2013. One of the prevailing player complaints is having upward of 10 percent of their paychecks held in escrow to conform to the 50/50 split of revenue with owners. The salary cap goes up, but if revenue doesn't grow in proportion, players forfeit a percentage of their pay. "I don't care how much money you make or what you do, you sign a contract, you feel like you've earned that and you expect that your employer is going to hold up his end of the deal," Chicago Blackhawks captain Jonathan Toews said. "At the end of each season to be told that they're going to take back 10 or 12 or 15 or sometimes 20 percent of your contract? I think that's a kick you-know-where. I don't agree with that, and I think there's a lot of things the NHL can do to promote the game and enhance the business side of the game. Their mistakes shouldn't be coming out of the players' pockets." The ultimate goal is to grow business big enough that escrow is reduced to zero and contracts are worth exactly as they're written. Players consider the Olympics one opportunity to grow the game. Bettman and the owners say stopping the season for two weeks is a significant disruption, but the Olympics will be a point of internal discussion and could extend to bargaining talks. "We need a long-term international calendar agreement with the owners," Fehr said. "And I think they share that view even if we have significantly different views as to what that calendar should be. But I would like to believe that we could figure out a way to do that. So is (going to the Olympics) definitely going to be a subject of collective bargaining? I can't say that yet. Is it possible? Of course." Given that lockouts wiped out the 2004-05 season and reduced it to 48 games in 2013, some star players and their agents looked ahead to a potential work stoppage in 2020 or 2022. According to PuckPedia , 77 players have signing bonuses in their contracts for the 2020-21 season totaling over $252 million — an increase of more than 10 percent from the amount of players who have bonuses in 2019-20. McDavid has $12 million of his $13 million salary that season in a signing bonus paid in July, Toronto's John Tavares will make $11.09 million of his $12 million with the lump sum and many other top players have the so-called lockout protections in their contracts — just in case. "I just hope as a player that I don't try to be looking at things differently or selfishly because I've earned that money ahead of time where obviously maybe other players haven't," Tavares said. "I think you try to put yourself in the middle and try to look at things objectively. "I think obviously, unfortunately, the last few times there's been opportunities for the CBA to be negotiated, there's been lengthy labor stoppages and something that obviously I had to consider. When you see that as part of history, you worry that that trend is going to continue." AP Hockey Writers John Wawrow and Larry Lage contributed.